Source, version and revision control for code is essential. Over the years I have used a few different source control systems starting with Visual Source Safe, then moving to Team Foundation Server (TFS) and Git which I currently use. I like to keep my code repos local as well as having multiple offsite backups. This post details how I configured and use my Synology NAS DS1513+ as my goto Git Server and how I automate offsite backups of all my code repos. GitHub is great for public repos but if you want to use a service such as GitHub for private repos then you have to pay. As of July 2015, up to five private repositories will cost you $7 per month. If like me you have many private repos GitHub will cost you $200 per month for up to 125 repos. My office NAS has 5 x Seagate Barracuda 4TB drives configured as Synology Hybrid RAID (SHR). This offers data protection of 1 disk fault-tolerance. Synology has a package centre which is like a dedicated app store for your NAS. 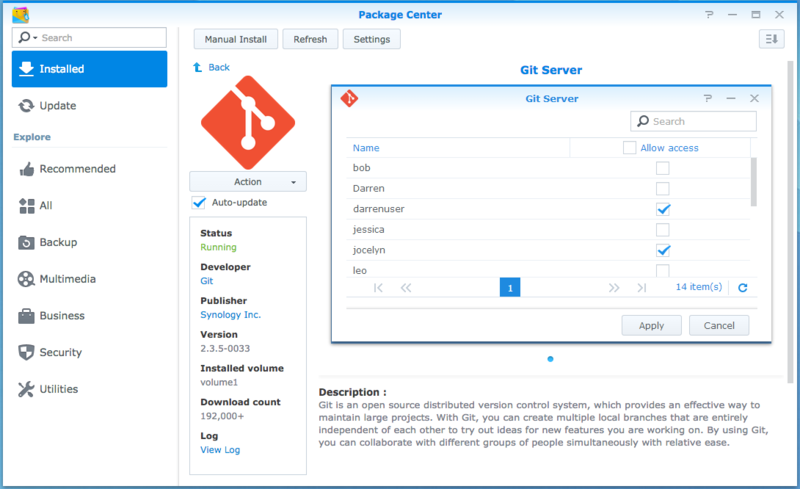 It's very easy to find and install the "Git Server" package with a single click.